BURTON, Sala Galante, (wife of Phillip Burton), a Representative from California; born Sala Galante in Bialystock, Poland, April 1, 1925; attended public schools in San Francisco and San Francisco University, San Francisco, Calif.; associate director, California Public Affairs Institute, 1948-1950; vice president, California Democratic Council, 1951-1954; president, San Francisco Democratic Womens Forum, 1957-1959; delegate to Democratic National Conventions, 1956, 1976, 1980, and 1984; elected as a Democrat to the Ninety-eighth Congress by special election to fill the vacancy caused by the death of her husband, United States Representative Phillip Burton; reelected to the two succeeding Congresses (June 21, 1983-February 1, 1987); died on February 1, 1987, in Washington, D.C.; interment in the Presidio of San Francisco. 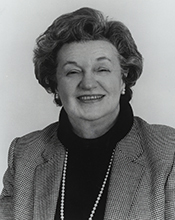 Sala Galante Burton in Women in Congress, 1917-2006. Prepared under the direction of the Committee on House Administration by the Office of History & Preservation, U. S. House of Representatives. Washington: Government Printing Office, 2006.